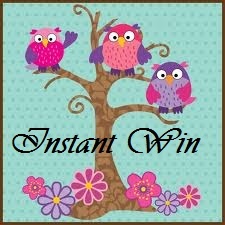 Homemaker Highlights: Instant Wins list. http://www.pureloveforpets.com/ (I won a free bag of cat food on this one). Ends 8/13/13. You can play for both cat and dog. https://www.facebook.com/butterfinger/app_451720294918972 (I won a TV show download). Ends on 11/10/13. http://www.mycokerewards.com/instant-wins/get-the-ball-rolling-instant-win/28030 Ends 8/02/13. Does not require codes. Just click "rules" and then read down to "5 C" and click "Click here" ....you will be given a free chance. You can play up to 5 times a day. https://www.hersheys.com/smores/en/account/signin.aspx (I won an 11 piece BBQ set on this one). End 9/06/13. https://www.facebook.com/thermacare/app_459563887459054 Ends 12/12/13. (I have won a lot of coupons on this one). http://www.mycokerewards.com/instant-wins/mcdonalds-arch-card-instant-win/26666 (Same free entries as above). Ends 9/2/13. http://yummiecode.com/ You can enter NOCODE and skip game. Ends 1/3/14. https://www.facebook.com/CharlotteRusse/app_297430323622264 (I won a 5.00 code off 30.00). https://www.facebook.com/BrewOverIce/app_428181490614416 (Won a tumbler on this one). Ends 9/3/13. Give me a holler at the email or any of the links below. Thank you for stopping and come back real soon! Email: Homemakerhighlights@gmail.com, Instagram, Twitter, Facebook, or Pinterest.